This is Tammy’s Easter issue from 1976. You might feel sorry for the younger Cover Girl, who gets a much smaller egg than her big sister. But on many covers she is the one who is the bane of her older sister. Inside, Tammy commemorates Easter with an Easter competition, “Easter Fun Parade” (Easter-themed jokes on the back cover), and Bessie Bunter. Cliff House revives old Easter customs: pie scrambling and orange rolling. Bessie wants to get in on the action, but of course it’s for eating rather than participating. Bessie’s classmates roll her lemons to teach her a lesson, and she cops a mouthful of lemon before she realises what they are. However, Miss Stackpole takes pity on Bessie’s miserable lemon face and rolls her a huge Easter egg to give her a happy ending. In the Strange Story, Joanne Lyons is taught a lesson about greed, but not for Easter eggs. After Joanne takes a horseshoe (she mistakenly thought it was stealing), she finds herself oddly haunted by horseshoes, especially when she tries to cheat or gets greedy. In Tammy’s 5th birthday issue she started a lineup of five new stories over three issues as “birthday gifts”. In this issue four of them end, which opens up a lineup of four new stories in the next issue. Not surprisingly, Bella Barlow is in the lineup. Throughout “Sarah in the Shadows”, Sarah Cole has been using her talent for paper cut-outs to get out of all sorts of scrapes. In the final episode this week it includes saving the life of music hall star Tilly Travers and bringing down Tilly’s evil partner, Mr Ford, who is in cahoots with the corrupt debtors’ prison governor. For reasons that are not satisfactorily explained, they are both determined to destroy Sarah and keep her unfortunate uncle in debtors’ prison. But now they are exposed, Tilly says she will make sure they never work again, and gives Sarah and her uncle jobs. John Armstrong’s current story, “Sit it out Sheri”, makes extremely liberal use of the myth of Marie Antoinette as a haughty, hard-hearted woman who single-handedly started the French Revolution with the way she treated the lower orders. A soothsayer bewitched Antoinette’s chair in the vain hope it would help her see the light before it was too late. Centuries later the same chair helps Sheri Soames overcome her shyness, but at the cost of giving her all the arrogance of Marie Antoinette, and this has gotten Sheri into terrible trouble. For a moment, Sheri even looks decapitated when she relives the moment where Antoinette is guillotined! Fortunately, enough people become convinced about the chair for Sheri to get out of trouble. Sheri retains her confidence, and the soothsayer is pleased he had more success with her than Antoinette. Alan Barker uses all the powers of “The Fairground of Fear” to get Sir Whitland to confess that he framed Barker on the charge that sent him to prison, just because he regarded Barker as too low to marry into his family. But Barker finds out the hard way that nothing he does will get the hard-hearted Whitland to do that. Barker settles for a surprise reunion with his daughter, whose death Whitland had faked to prevent him from claiming her. In the final episode of “A Lead through Twilight”, farmers are after Twilight because they think he’s a sheep worrier. Fortunately they all see Twilight tackle the real sheep worrier, and Twilight is cleared. The scientific research used on Twilight is used to give Carol her sight back. “Claire’s Airs and Graces” is the only ‘birthday gift’ story that is still running. Claire Weston-Jones has her classmates thinking she has a more privileged home life than she actually does because she fears the derision of her more snobby classmates if they discover the truth. As expected, living the lie causes all sorts of complications, and this week Claire’s parents could have been really hurt for it. They make the effort to provide a spread for Claire’s classmates, but nobody turns up because Claire doesn’t want them to see her house is not the palace they have been led to believe. This week’s Wee Sue story also has a moral about living a lie. Sue’s classmate Ann spun a big yarn to her French penfriend Louis about her interests, and even sent a picture of Sue, saying it was herself, because Louis is a small person. Now Louis is visiting, so Ann wants Sue to help keep up the pretence. But the pretence unravels when it turns out Louis is much taller than Ann thought (got metrics and imperials mixed up). Molly Mills has received an offer for a change of employment. Spiteful Kitty and Betty try to sabotage it by planting Lady Stanton’s hat on a snowman and looking like Molly did it, so it looks like it’s the end of that chance. But everyone is taken by surprise when Lord Stanton’s response is promote Molly to head chambermaid! Princess Bright Ideas Box: Pretty as a Picture! “The Incredible Shrinking Girl!” is the cover story this week. It is only fair, because this is the final episode; the incredible shrinking girl returns to normal size after being hit by fly spray. This was the first story to be ejected from Princess II’s first lineup, after five episodes. The short run should not be taken as a reflection of its popularity, or lack of. As Princess II progressed, many of her serials had short runs, running at 5-6 episodes. In “Their Darling Daughter”, Sylvie can’t convince her foster parents that Mrs Crooks is pulling nasty tricks to get rid of her. And now Mrs Crooks has turned extra nasty after Sylvie scores her first triumph over her with help from Ben the dog. Mrs Crooks is taking advantage of Sylvie being left alone with her for the weekend by saying it’s going to be her last. Now what can the old bat mean by that? Whatever it is, it sure sounds like she’s knocking off the fancy stuff now and just going in with her big guns blazing at full throttle. In “Ring of Feathers”, Cheryl discovers her Uncle John is out to destroy the woodlands, and with it the birds’ habitat. But there’s a loophole in his deed of ownership that says the woodlands must be left intact. Looks like the woodlands are safe after all, but Cheryl doesn’t realise her uncle is plotting to destroy the deed and make a forgery. And now Uncle John is stealing the ring of feathers – which will take away Cheryl’s power to get help from the birds. Things really get in a pickle in “Miranda’s Magic Dragon” this time. Miranda from Camelot is stuck in 1983, and now a mistake on behalf of the evil Mordac whisks Miranda’s 20th century friend Liz away to Camelot – along with her house! Meanwhile, sly Paula is still hiding Miranda’s magic pendant, and without it Miranda is powerless. Mr Andrews has been desperate to make a meal out of Mr Evans the talking rabbit, not realising he really is a human turned into a rabbit. But this week he pulls a hat trick – literally – to save Mr Evans when his unpleasant owners come in search of him. Sandy’s audition fails in “Stairway to the Stars”, though she does get handy advice afterwards. Meanwhile, it’s not just Dad who’s calling Terry’s dancing “cissy” – bullies in the street are now doing it as well. For once Grovel does “Sadie in Waiting” a good turn. Princess Bee is imposing early morning keep fit jogs on the staff, much to Sadie’s consternation. But when it’s imposed on Grovel (much as he needs it), the results put Princess Bee off the idea completely, to Sadie’s great relief. The third issue of Princess II came with no free gift, which is unusual for the third issue in a new IPC series. Usually all the first three issues of a new IPC series came with gifts. “Their Darling Daughter” is the cover story this time, and without the free gift there is more room for it on the cover. 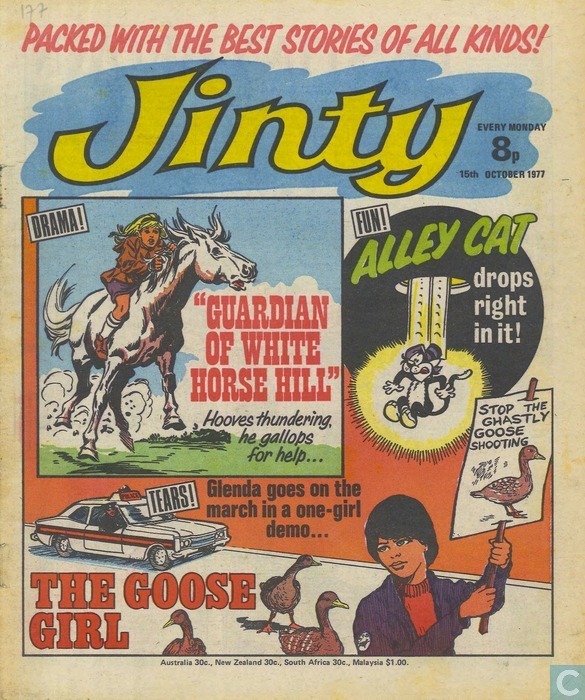 Unlike Jinty or Tammy, Princess clearly liked to rotate her stories so each would get a chance to be on the cover. That certainly made for more variety on the covers. In the episode, Mrs Crooks tricks Sylvie into ruining Lady Towne’s birthday party by having her show up in the dress Rachel wore when she died, which shocks Lady Towne into a faint. At least it should make Sylvie realise that Mrs Crooks has only been pretending to be friendly with her and is still out to get rid of her. Mr Evans the talking rabbit hitches a ride home with Jenny – only to find Mr Andrews is so desperate for food and no money to buy it that he wants to eat the rabbit. Will Mr Evans end up in a rabbit stew before Jenny can get to the book of spells that can change him back? “The Incredible Shrinking Girl” is horrified to find her family is out to make money out of her condition and turn her into a cash cow. They even have a line of incredible shrinking girl dolls planned. Their excuse is that they now have a chance for money when they had always scraped by, and they have the nerve to call Clare selfish for protesting against it. Then they get a shock when they find it looks like a cat has had Clare for dinner. It’s not just Mordac who’s after Miranda now in “Miranda’s Magic Dragon”. A nasty 20th century girl, Paula, gets suspicious of her and won’t let up until she finds out the truth. Meanwhile Mordac’s servant finally manages to get hold of the pendant while Miranda sleeps. “Stairway to the Stars” really gets into its stride when it’s revealed that the school is in danger of closing because there are people on the council who don’t approve of funding it. Meanwhile, Terry, the only male protagonist in the story, is revealed to be a Billy Elliot. His father doesn’t approve of him attending stage school because he thinks it’s “cissy”. Cheryl is beginning to understand the power of the “Ring of Feathers” while the school bullies are getting suspicious of it. Meanwhile, slave-driving Uncle John is working Mum so hard that she faints from exhaustion. In “Sadie in Waiting”, Princess Bee can’t find a disco outfit. In the end she settles on Grovel’s uniform (a rather odd choice as it is too big for her). All Grovel can find to wear is a maid’s uniform, much to his embarrassment.